The marine iguana has a scaly loose skin with a squished looking face and long claws. Marine iguanas are primarily black. The average adult male is 1.3 meters (4.25 ft) while the female is 0.6 meters (2 ft). Different subspecies vary in color and size. 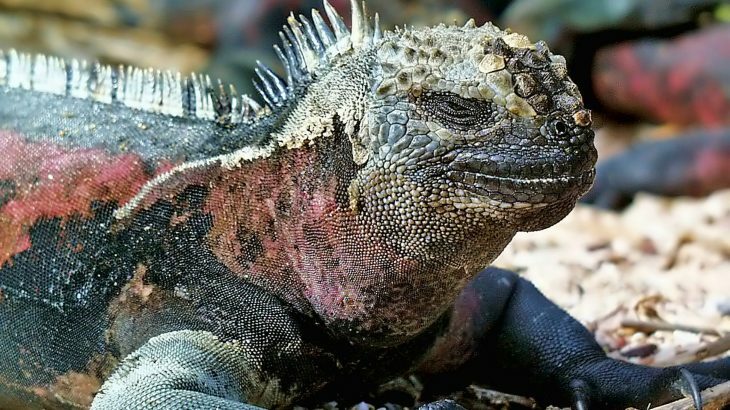 Despite their less-than-beautiful appearance, the marine iguana is a unique species. It is the only species of reptile that forages in the sea. This makes it the only known marine reptile. Scientists believe that this species evolved from land iguanas around 4.5 million years ago. This species occurs only on the Galápagos Islands. Like many Galápagos species, distinct subspecies live on different islands. These subspecies each have unique coloration. Their small geographic range puts them at risk of extinction. The marine iguana has never had any natural predators. Because of this, they are extremely docile. This makes them very popular with tourists. The iguanas generally live in large colonies. They will pile onto each other on cold nights to conserve body heat. They generally stay near the coast, though they are great climbers and are often seen on top of cliffs. The marine iguana gets its name because it forages for food at sea! This is unique in the reptile kingdom. 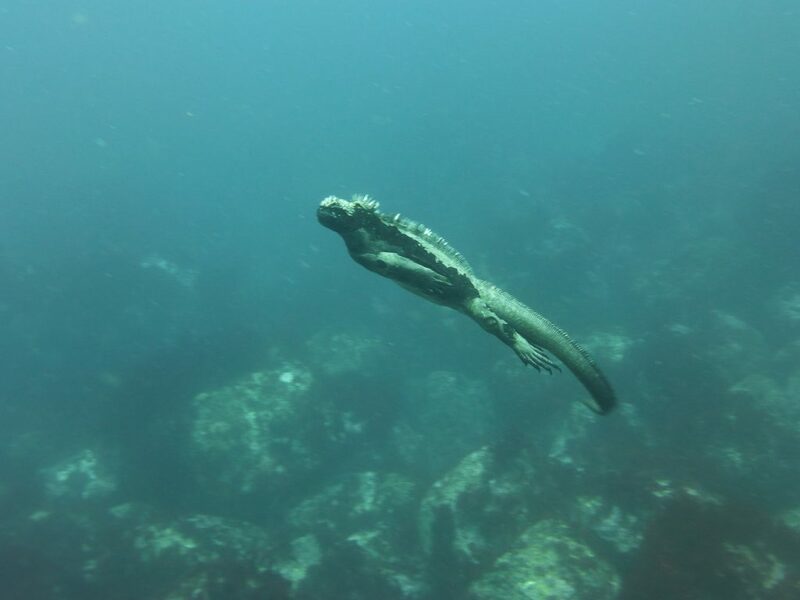 The marine iguana can dive as deep as 30 meters! The male iguanas can dive up to 30 meters (100 ft) deep to forage. Stronger iguanas swim out into the tides, anchoring themselves on rocks. The younger iguanas and smaller females stay closer to shore. Only about 5% of the iguanas dive for food. These are large, strong males. They dive in order to avoid competition in shallow water. Adult iguanas can dive for up to an hour. This is an impressive feat for a land animal, especially a reptile. Diving deep in the cold ocean water is difficult for a cold-blooded reptile. The marine iguana must lower its heart rate and metabolism when diving. This allows their body temperature to drop by 10 degrees Celsius while underwater. Even with these changes, the conditions are extreme. In order to prepare for these extreme conditions, the iguanas must bask in the sun, preparing for their dive. Though it may look like these lizards just relax in the sun all day, basking is essential for the lizards to live. This absorbed heat keeps them from being immobilized in the cold water. This marine iguana has found some delicious algae. The marine iguanas feed on algae. These marine algae grow on rocks near the shore. There have been nine species of algae identified as iguana food. 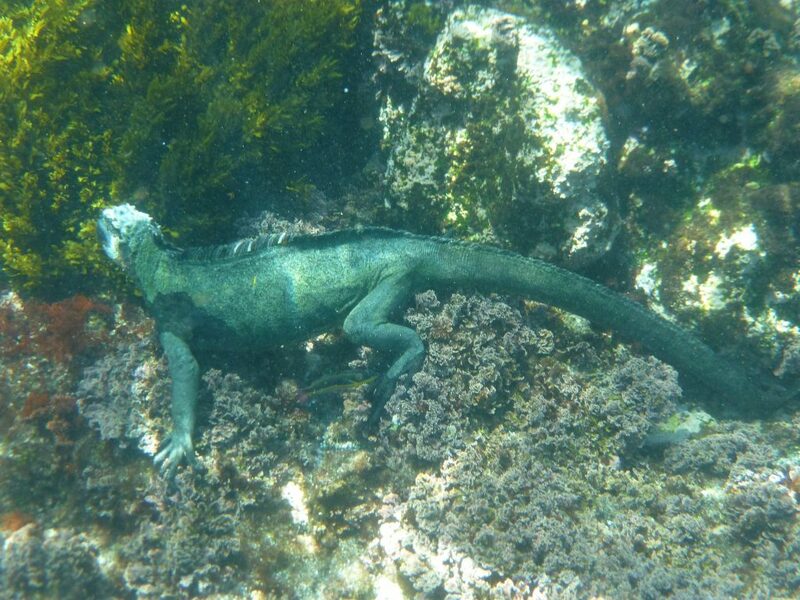 The iguanas prefer inter and subtidal algae. There are 4-5 species of red algae that they prefer to eat. Other species are added to the diet when the good stuff isn’t available. Though they are mostly marine foragers, the marine iguana can eat other food sources. They have been seen eating grasshoppers, crustaceans and sea lion afterbirth! When times are really dire, the marine iguana resorts to eating feces. They will eat the droppings of other iguanas as well as that of sea lions and red crabs. Though the marine iguana is isolated on the Galápagos, global weather patterns affect them. The El Niño Southern Oscillation Event (or ENSO) decreases algae on the Galápagos islands. The increased rainfall and surface temperature decreases the algal growth. During these events, the iguanas will shrink by up to 20%. It is believed that the lizard’s bones may actually shrink by up to 10%! These changes are quickly reversed when food becomes available again. The unusual eating habits of the marine iguana require some specialized adaptations. Diving in the sea comes with unique hazards. The amount of salt in seawater causes a risk of dehydration. In order to combat this, they evolved salt glands. These glands take excess salt and force it out of the lizard’s nostrils. All this salt sneezing gives them a white crown. 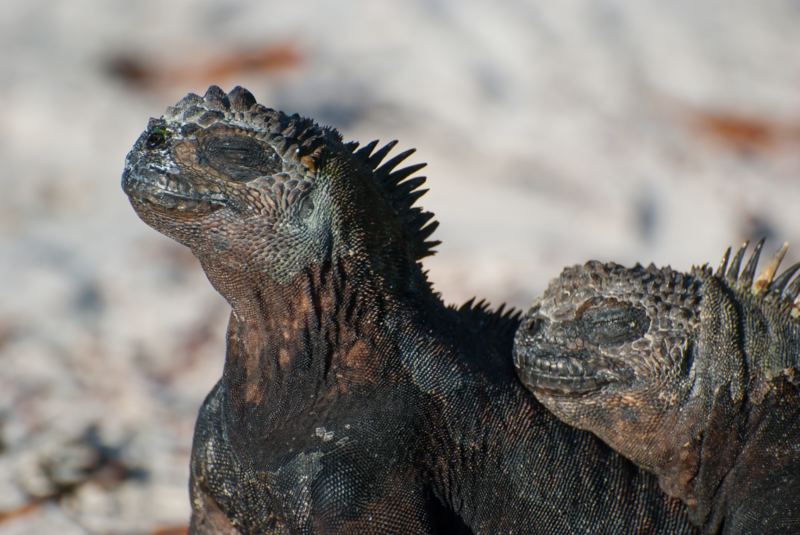 These marine iguanas are enjoying the sun. The marine iguana is a uniquely interesting reptile. Its diet of algae is entirely unique for a reptile. This species is threatened with extinction due to its tiny range and specialized diet. Though they have survived ENSO events in the past, these are becoming more frequent and intense. Climate change is causing extreme weather years to become more common. This threatens the marine iguana’s food source. Consecutive low-food years could be disastrous. In addition, their small range poses a threat. Localized events could wipe out the entire species. Though they are protected, as are the Galápagos Islands, pollution in the ocean can’t be controlled. A nearby oil spill could greatly harm this species.